Saturn is offering current owners 1500 more reasons to stay in the family. "These days, it seems good news is hard to come by, particularly in the car industry," said an email received by SaturnFans.com earlier today. 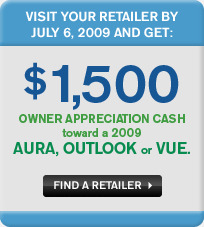 Current Saturn owners can receive $1,500 in Owner Appreciation Cash toward a 2009 Aura, Outlook, or Vue. Owner Appreciation Cash is also good for $750 toward a 2008 Astra, $1,000 toward a 2009 Sky, and can be combined with other cash offers. "Consider it a thank-you for sticking with us." This offer expires July 6, 2009. Visit your local retailer for all the details.